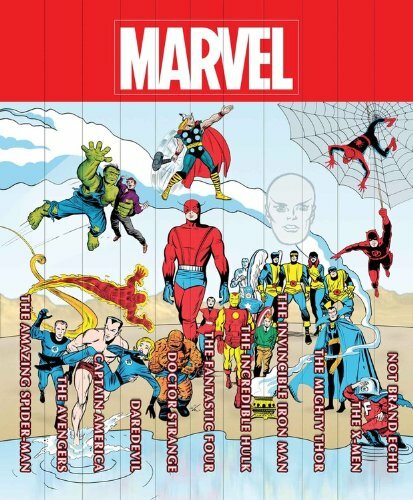 In celebrati on of its 75th Anniversary, Marvel Comics proudly presents this deluxe collecti on of its 10 mightiest Masterworks hardcovers - plus the all-new, long-in-demand NOT BRAND ECHH VOL. 1 and the AMAZING SPIDER-MAN #1 75TH ANNIVERSARY BY ALEX ROSS POSTER signed by none other than Stan "The Man" Lee! Each titanic tome in this limited-editi on boxed set features a newly designed cover treatment and interlocking spine artwork, and the slipcase itself is patterned after stately Avengers Mansion! Order yours today, True Believer, while supplies last! 264 PGS./COLLECTING TALES OF SUSPENSE #59-81. 328 PGS./COLLECTING STRANGE TALES #110-111 AND #114- 141, AND AMAZING SPIDER-MAN ANNUAL #2. 456 PGS./COLLECTING NOT BRAND ECHH #1-13; AND MATERIAL FROM AMAZING SPIDER-MAN ANNUAL #5, AVENGERS ANNUAL #2, DAREDEVIL ANNUAL #1, FANTASTIC FOUR ANNUAL #5 AND SGT. FURY ANNUAL #4. 272 PGS./COLLECTING AMAZING FANTASY #15 AND AMAZING SPIDER-MAN #1-10. 272 PGS./COLLECTING FANTASTIC FOUR #1-10.